In a dominant position in Gordes, and just a few minutes walk from the village centre, a stone-built property comprising a principal residence and a guest house with two swimming pools on 2,000 m² of land. Main House: Large living room with fireplace, study / TV room on the mezzanine, huge fully equipped open plan kitchen opening onto a pleasant terrace, pantry / laundry room, master bedroom with bathroom and toilet and a mezzanine office area, bedroom 2 with bathroom + wc, bedroom 3 with shower room + wc, bedroom 4 with bathroom + wc. 10 meters lap pool with lawned terracing and technical area. Guest house: Large living area including fitted kitchen / dining / living room with fireplace opening onto a partially covered terrace for dining in summer. Upstairs bedroom 1 with shower + wc and bedroom 2 with bathroom + wc. This guest house has its own 7 m x 4 m swimming pool with stone and lawned terracing. The 2,000 m² of land is fully enclosed by walls and closed by two electric gates. 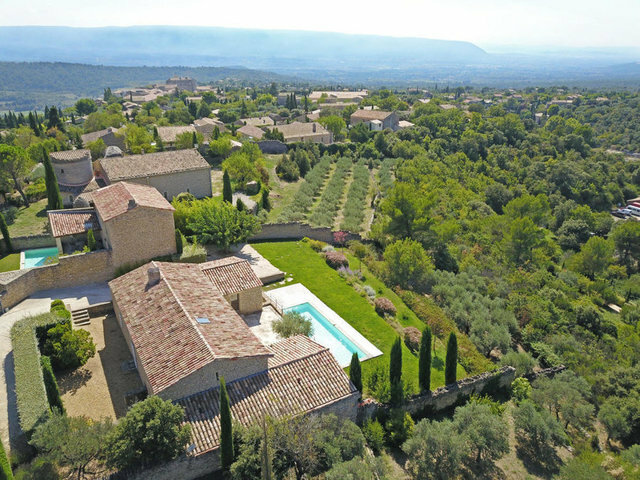 It is landscaped with lovely views over the village and the valley to the Luberon and the Alpilles.